K.D. Lang (vocals), Teddy Borowiecki (piano, keyboards, accordion), Ben Mink (acoustic & electric guitars, fiddle), David Piltch (acoustic & electric bass), Ralph Morrison, Sara Parkins, Tiffany Yi Hu, David Stenske (violin), Brian Dembow, Cynthia Fogg (viola), Stephen Erdody, Cecilia Tsan, Armen Ksajikian, Larry Corbett (cello), Clayton Cameron (drums), Eumir Deodato (strings arrangements, conductor). 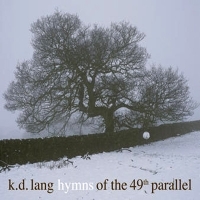 On Hymns of the 49th Parallel, K.D. Lang's first for Nonesuch Records, the Canadian songstress fulfills her longstanding desire to create a Canadian songbook. On the album, she pays homage to fellow Canadian artists including Joni Mitchell, Leonard Cohen, Neil Young, Jane Siberry, Ron Sexsmith, and Bruce Cockburn. "These songs are part of my cultural fabric, my Canadian soundtrack. They have nurtured my musical DNA", lang says. "To recognize and honor the profound impact they have had on me, my approach to interpreting these songs is to sing them as honestly, as purely, and as true to how I heard them as possible, with respect and reverence for the songs and for the songwriters...as hymns... simply songs of praise". While countless artists have put forth versions of American standards, the lineage of Canadian songwriters has been all but overlooked. In the absence of an existing Canadian songbook, lang chose to anchor Hymns with a few canonical artists : Mitchell, Cohen, and Young. Siberry, Sexsmith, and Cockburn were included not only because they are among lang’s favorites, but because they show the country’s rich songwriting culture continuing into the present and future. Lang has long been celebrated for her imaginative interpretations. Her fresh takes on country classics - especially on the landmark Shadowland (1988) and the Grammy-winning Absolute Torch and Twang (1989) - were so original and unorthodox that they elicited controversy from country purists, in addition to wide acclaim. On Drag (1997), lang applied her singular style of torch singing to a high-concept album, using smoking as a metaphor to examine the nature of human desire. Most recently, she collaborated with Tony Bennett on a Grammy-winning exploration of American songs. Lang is an equally accomplished songwriter, having won vast praise for her self-penned Ingenue (1992) and its follow-up, All You Can Eat (1995).